How many of you have tried candied orange peels? They are a really wonderfully different little treat and refreshingly cool. Made from actual oranges and no artificial flavors added. A great thing to make this time of year when oranges seem to be so perfect. You may also follow the same recipe for Lemon and Lime peels and they are equally delicious! For some who is not aware, The National Candied Orange Peel day is Celebrated every 4th of May each year. Candied orange peel has been used ever since as a delectable garnish to cakes in countries with abundant oranges, because of their thriftiness of saving the normally discarded peel. These orange peels are easily kept food item, because the sugar that coats them also work to preserve them. This is what makes the candied orange a favorite addition to the pantry of most baker from around the world. The procedure of preserving foods using sugar and honey is medieval. As a matter of fact, there’s an evidence that it was used commonly in prehistoric China and Mesopotamia for assorted cakes and food. If you’ve got a taste for sweets with family and friends, candied orange peel is the perfect snack to give for the holidays or any occasion (especially if there’s a lot of oranges around the fridge). It is best when dipped with melted chocolate. Creamy chocolate, bitter sweet candied fruit. It’s very easy to make and there’s no excuse not to try these simple, delicious sugary treats! Happy cooking and enjoy! Rinse the oranges. Slice the oranges into 4 quarters and remove the orange peel. Also, scrape out the white pith or part of the peel (use a peeler for this). White Pith is the part of the orange that’s white, stringy, and spongy. It is found between the peel and the fruity pulp. Once the white part is removed, slice the orange peel into 1/4 inch strips. Not too thin and just enough thickness so it doesn’t mashed up when cooked. In a large pot, soak the peels with enough cold water to cover the orange peels. (Optional:you may soak it overnight to make sure it will release all the bitter taste, drain and add a new cold water again after). After soaking in cold water, bring it to a boil. Over high heat let it boil for 5 minutes. Turn off heat, transfer in a colander to drain and wash in cold water. Do this process 2x more (Soak, Boil and wash). This process will reduce the bitter taste of the peel. In a medium saucepan, add 2 cups of water, stir in 4 cups sugar. (By comparison, simple syrup would be equal parts). Then, add in orange juice and the orange peels. Bring it to boil, simmer over low heat and cook until the orange peels become translucent, and the syrup starts to thicken. To test the thickness, drop some of the hot syrup in cold water and if it forms a soft thread. It’s done. As much as possible, prevent from stirring too much, swirl off the pan instead. Turn off heat and drain remaining syrup. 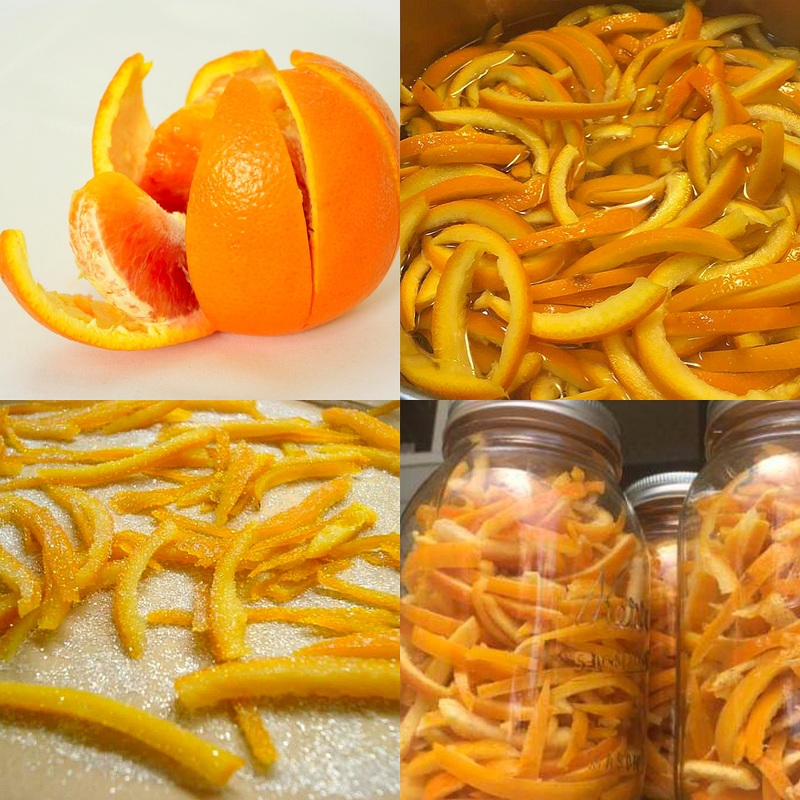 Transfer each peel separately on a wire rack and let it dry for 8 hours or longer. Once dried roll it in a sugar and transfer into candy bottles or airtight containers.